Life is a job in itself. Wake up, work, eat, sleep, and do it all over again. To some, that's all life consists of. No moments of excitement. Just finding ways to make ends meet. In Caryl Churchill’s Fen, we watch a group of women forced to work in the marshlands of southeast England in order to put food on the table. In Red Garnet Theater Company’s production of the Churchill play, the hardships and treatment of the working-class is examined in theatrical fashion. Originally performed in 1983, Fen captures the Caryl Churchill style, blending theatricality with reality to tell a real life saga of the working-class. Told through snapshots of intertwining stories, Fen chronicles the people of the Fen and how traditions are passed down from generation to generation. Using a small company that portrays an assortment of roles, Fen may be one of Churchill’s lesser-known works but packs one heavy punch. For the most part, the central character is Val, a young woman who goes on a journey to not only find faith in a new love and life while dealing with the harsh realities of her past and present. We move into scenes featuring her cohorts, all who pass time with gossip, playful passages where the children pass time by rummaging around the land interacting with various elders, and snippets of life as the women and girls are getting dirty with the land. With so many characters to track, director Patricia Lynn needed to find a way to give each character a personality yet keeping the pace swift, avoiding massive costume shifts. It takes some time before we can truly grasp many of the relationships but once you catch on, the story illuminates. Lynn’s sleek staging optimized the production. The scenes bleed cleanly into one another, rarely allowing dead air. Exploring the less is more theory and utilizing only a handful of props, Lynn was still able to portray a world unfamiliar to the audience. Lynn painted a picture of a dank marshland where dreams go to die. At first pass, choosing to use a long lane of playing space with the audience forced to sit on opposite sides of the room sounds worrisome. Yet Lynn kept the action varied, employing the deep ends to her advantage. She even played with the upper tier of the theater as a playing space, utilizing levels to her advantage. Val was the only clear arc in Fen, which may be due to Churchill's writing or the dominating performance from Aimee Rose Ranger. Ranger radiates with hope. There is something delightful the way Ranger carried herself through Val’s journey. Lizzie Vieh is transformative, easily shifting age and gender. As the resident male of the company, Rudi Utter offers gruffness, portraying the drastic differences between gender in this world. His times as Frank against Ranger’s Val were heartwarming. Rounding out the company, Annie Harper Branson, Katie Consamus, and Lauren Lubrow fill out the ensemble parts, shining through their notes of humor. Why Fen is not produced more often is a bit shocking. 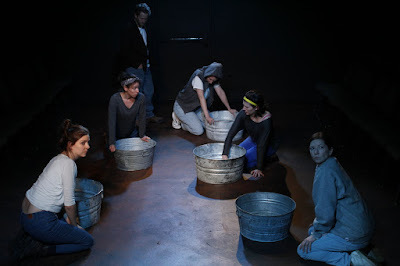 Red Garnet Theater Company has provided a solid production of a strong text. Sure the storytelling took some time to heat up, once it did, the audience was along for the ride.